Retail environments often need to use commercial blinds to control privacy, lighting and create a certain look. However, with such variety of options available in the market today it is easy to become confused about which styles and materials to go for. Here are some tips to help you choose the right commercial blinds for your retail space. The different types of blinds have different functionality and therefore different functional advantages. Your main focus should be on choosing the blinds that best complement your windows and doors, and make the lives of your staff better. The blinds are part of the environment. The interaction with them and the effect they have on the internal and external setting should be considered in the purchasing decision. 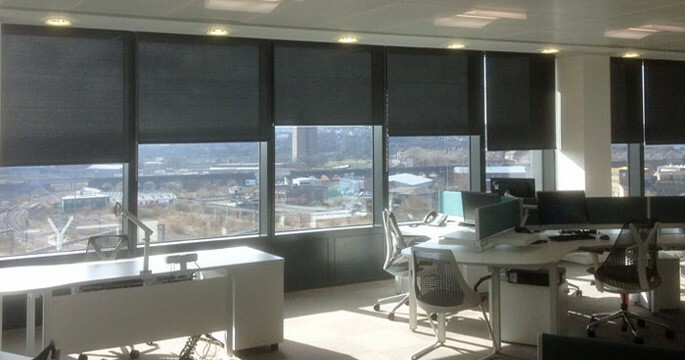 While roller blinds for example are easy to operate, stylish, and are great to move from light to completely dark in an instant, Venetian and Vertical blinds allow for easier and more subtle control of light and privacy. Fabric blinds may allow you to cut glare from sunlight in the retail space without shutting off the view of the environment. It’s a good idea to get some expert help and to see how other retail businesses are controlling their environments with commercial blinds. Every business has a corporate culture. One of the best ways to create, enhance and adapt this culture is by using the design interior of your retail environment. Paint, furniture, lighting and your choice of blinds can help you create a specific mood or feeling around the offices within a retail environment, and front of house. Roman blinds made of light coloured fabric will offer a sophisticated feel, but, for a striking mood, use vertical blinds with patterned fabrics. Think carefully about the message you are conveying not just to your retail customers, but also to your staff. If you don’t get the details right in your interior design the purpose may be defeated. It is therefore best to have a unified approach to colours, images and textures that fully encapsulates what you want to achieve with your decor. This will make sure you bring in commercial blinds that fit into and complement the overall design and feel of your retail space, without sacrificing functionality. When it comes to commercial blinds, many retail businesses use neutral colours because of their versatility, but mainly because they are ‘safe’. Depending on your retail demographic you may be best served mixing and matching several blind materials and colours. Such bold décor can lift the mood around the office space for both customers and staff. This is especially the case where the target demographic cuts across a broad wide range of individuals, and where the function of the environment is to solve problems and make people’s lives better. When choosing retail blinds think carefully about the reasons behind your decisions. Don’t just go for the same as everyone else unless there is a really good reason to do so. Your blinds are a way to differentiate your environment from that of the competition.